If you're in the market for a new full-size, light-duty pickup, just going straight for the 2017 Ford F-150 is an easy choice. Let's be honest, it can't be America's biggest-selling vehicle for nothing, now can it? Well, if it was that straightforward other trucks wouldn't sell as well as they undoubtedly do, and plenty of buyers do choose models other than the F-150. So, let's compare Ford vs Nissan by doing a 2017 Ford F-150 vs 2017 Nissan Titan comparison to see which comes out on top. We like our pickup trucks to pretty much look a certain way, and only a foreign or a brave domestic manufacturer would stray too far from the generally accepted formula. The 2017 Ford F-150 fits the classic truck blueprint to a tee, with big, blocky dimensions and unmistakably flat panels, and with reassuring rectangles favored over seductive curves all the time. The Titan has recently been redesigned and it's much more macho and aggressive than it has been previously, although the currently styling does tend to make it look a little smaller than it really is. The Nissan has improved, but when it comes to F-150 vs Titan styling, the Ford is a clear winner. Looks undeniably matter, but for most truck buyers it's more about capability than it is with just about any other sort of vehicle marketed at both retail and commercial buyers and operators. Payload and tow ratings are the two most basic and obvious measures of capability, and the 2017 F-150 can haul as much as 3,270 pounds and the maximum tow rating is 12,200 pounds. Unfortunately, despite its new and more macho appearance, the Titan does fall a little short in this all-important area. The most a 2017 Nissan Titan is capable of hauling is just 1,940 pounds, and the maximum towing capacity is also quite a bit less than the Ford at just 9,730 pounds. Whichever way you look at it, this is a substantial and important victory for the F-150. Although commercial buyers are likely to be much more concerned with the fuel-efficiency of a new truck than retail buyers right now, nobody likes to pay more for fuel than they need to. The most fuel-efficient version of the latest F-150 does pretty well with EPA-estimated ratings of 19 mpg in the city, 26 mpg on the highway, and 22 mpg combined. Of course, you can get a lot worse than those figures if you try. A Nissan Titan equipped with its V-8 gas engine can’t match the F-150 here either, as the best it can do are EPA figures of just 15 mpg in the city, 21 mpg on the highway, and 18 mpg combined. This is another victory for the Ford then. 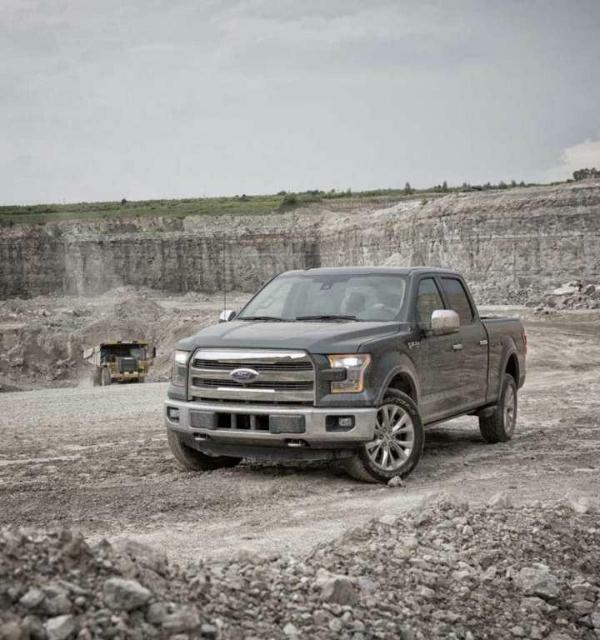 There are four engines, seven trims, three bed lengths, three body styles, and two drivetrain options with the F-150, and unless you go for the most basic model, there's no such thing as a Spartan F-150. Even the entry level XL gets you air-conditioning, an automatic transmission, a stereo and a tilt/telescoping steering wheel. And from there the sky really is the limit. The base S version of the Titan is basically the no-nonsense work truck of the lineup, but even then it has a few more standard features than other entry level rivals. With the likes of a 5.0-inch color screen, a USB port, two 12-volt outlets, NissanConnect with mobile apps, Bluetooth phone and audio streaming, remote keyless entry, air conditioning, aluminum step rails and more, this is a win at last for the Nissan. If you’re looking at the very base models, it’s easy to make a case for the 2017 Nissan Titan as you do get an impressive amount of standard kit for your money, although even then, it does cost more than the most basic F-150. Overall though, this comparison shows us just why the F-150 sells in such massive numbers and the Nissan doesn’t. For more information on the 2017 Ford F-150 and to arrange a test drive, get in touch with us here at Southern California Ford Dealers today.